Welcome to the Printers Boot Camp. 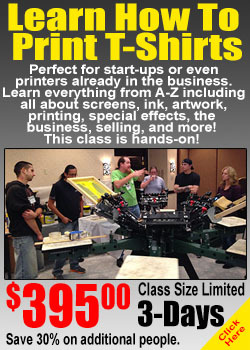 We offer hands-on T-Shirt Printing classes that will change your business and make you more successful. Our next T-Shirt Printing class is June 25-27 followed by our Sublimation class June 28. We just released out schedule for the rest of the year. Check out additional class dates HERE. Whether you are a total beginner or have been printing for awhile - we have a class for you. Are you starting a T-Shirt printing business? Do you already print but need to learn how to do things the right way? Our intense Garment Printing Boot Camp workshops cover everything about the garment printing process including T-Shirt printing from A-Z. Plus, we have expanded our Digital workshops to now be one full day for Sublimation. We are currently only offering classes in Bowling Green Kentucky. Classes are taught by industry veteran Mike Fresener who has had thousands and thousands of happy students from around the world.